Flexible bollards can be set into new concrete by positioning the bollard in its intended location and then pouring concrete. The bollard becomes a fixed device for lane demarcation or for creating traffic friendly perimeters. Flexible bollards will bend up to 90° upon impact to reduce damage to vehicles, making them ideal for traffic applications. It is important to note that with this installation method, the bollard’s function is strictly visual and offers little impact resistance. Please refer to the product drawing for each specific model to determine some of the measurements in this installation guide. Handle with care to avoid scratching or damaging bollard surfaces. 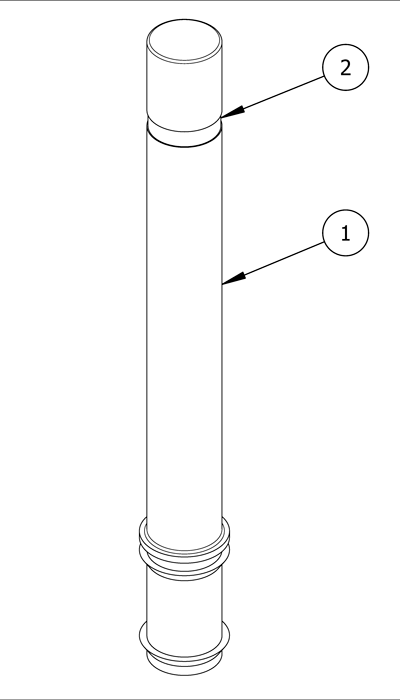 Refer to site plans to locate the precise center point of each bollard. Ensure that the plan coincides with the site and familiarize yourself with the intended arrangement of the bollards. Dig below the recommended digging depth—or to the required depth for the bollard—whichever is greater. Note: The required depth for the bollard differs based on the bollard model. Refer to product drawings to determine specific depth measurements. 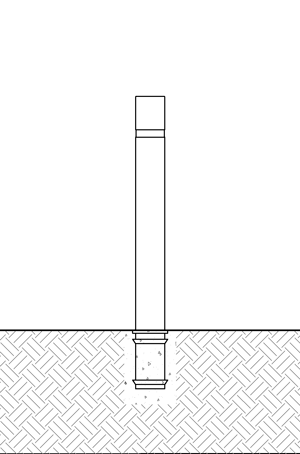 The diameter of the hole should extend a minimum of 2″ from the sides of the bollard base. Center the auger on the installation mark and bore a hole to the required measurements. Ensure the area is properly formed to create a perimeter that will hold wet concrete. Use a dirt tamper to compact the soil below the intended surface. Keep the bollard in its protective packaging and place near the site. When ready to install, remove packaging and scrunch up paper or newspaper and put inside the hollow bottom of the bollard to prevent debris from entering. Ensure that the proper ratio of water and concrete mix is used. The concrete should have a similar texture to moldable clay. Lower the bollard into designated location. The bollard should be installed so that a predetermined portion of the bollard will sit below the finished surface of the concrete grade. Refer to product drawings to determine specific measurements. Take care to pour the concrete evenly, ensuring the surface is level. Hold a level against the side of the bollard and ensure that it remains plumb. Note: Once the concrete has cured, there will be no way to make any adjustments. Ensure the bollard is plumb. For damage repair or other servicing needs, please contact Reliance Foundry’s sales department. Reliance Foundry manufactures its products to the highest design standards to ensure their durability. Reliance Foundry’s bollards are finished with long-lasting powder coating. In most North American environments, routine inspections and cleaning will ensure that bollards retain their aesthetic appeal. Proper care and maintenance are required to maintain the finish and ensure a full service life. Flexible bollards with embedded mountings can be installed in new concrete.